Synopsis: Poppy Wyatt has never felt luckier. She is about to marry her ideal man, Magnus Tavish, but in one afternoon her “happily ever after” begins to fall apart. Not only has she lost her engagement ring in a hotel fire drill but in the panic that follows, her phone is stolen. As she paces shakily around the lobby, she spots an abandoned phone in a trash can. Finders keepers! Now she can leave a number for the hotel to contact her when they find her ring. Perfect! This is a very quick read; it took me two days and I’m a fairly slow reader. 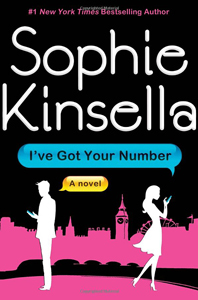 Comparing this book with Remember Me?—another novel written by Sophie Kinsella—I’ve noticed that she has two main ingredients: a love-triangle and plot twist(s). I hope that doesn’t deter you from reading I’ve Got Your Number, but I do think everyone should read books that don’t involve too much analysis of symbolism and themes (Lit class, anyone?). The plot is fairly straightforward: girl loses engagement ring and her phone, finds a phone, and drama ensues. The style of writing may seem choppy with its abrupt one-word fragments, but to me, I feel like it shows a string of Poppy’s thoughts. I think it’s cute (yes, I’m using that adjective!) that Kinsella’s character puts footnotes to make herself appear more professional. I remember reading another novel that used footnotes too, but in that case, it was to convey irony. For graphic designers, maybe even artists, Kinsella uses different types/fonts to denote text messages and storyline, which I think is quite clever. Epistolary novels come in many forms from letters to e-mails, but I’ve Got Your Number may be the first to use SMS to advance the plot, so I have to give credit to originality. Though, I could delve into a whole spiel on how society is becoming less social and using machines to communicate with one another, but I think I’ll just leave it at that.